Alumni in Class of 1909 H.S. Research performed by Scott Cowley has identified 32 Brigham Young High School graduates. Only one has been found receiving a Commercial Diploma, where normally 10-20 Commercial graduates would be found, so at least this portion of the class may still be missing. A famous 1909 photo shows 20 BYH Commercial students wearing identical outfits, with a large "C" on each jersey. A review of the roster shows that 14 of those pictured graduated with a Commercial Diploma in 1911. One graduated in 1910, and one graduated in 1910 and in 1911. That leaves five unknown. They have been listed with the Class of 1909 with a question mark. They include: Florence Bee, Eva Page (Wanlass), Deloss Paxman, Leon Neuren, and Cyril Duffin. One additional BYH student, Reuben W. Radmall, has also been listed with a question mark, until further research can be done to discover his actual BYH class year. Brigham Young High School, Class of 1909. Katie Anderson. She received a Normal Diploma. Source: Students Record of Class Standings B.Y. Academy, Book 2, Page 281. ~ ~ ~ ~ IS THIS? Katie Maria Anderson, who was born on September 22, 1889 in Fountain Green, Sanpete County, Utah? If so, her parents were John (Johan) Anderson and Eliza Maria Bischoff. Katie married Frederick Irving Abbott on September 6, 1930 in Farmington, Utah. Katie Marie Anderson Abbott died on November 11, 1958. Brigham Young High School, Class of 1909. William Baker. He received a High School Diploma. Source: Annual Record, B.Y. University (BYU Records Office), Book 3, page 443. Brigham Young High School, Class of 1909. Julius B. Beamson. He received a High School Diploma. Source: Annual Record, B.Y. University (BYU Records Office), Book 3, Page 139. Brigham Young High School, Class of 1909. Wyman Berg. He received a High School Diploma. Source: Students Record of Class Standings B.Y. Academy, Book 2, Page 205. Brigham Young High School, Class of 1909. Faun Brimhall. She received a Diploma in Regular Arts. Source: Students Record of Class Standings B.Y. Academy, Book 2, Page 226. Brigham Young High School, Class of 1909. Wells T. Brockbank. He received a High School Diploma. Source: Annual Record, B.Y. University (BYU Records Office), Book 4, Page 17. Brigham Young High School, Class of 1909. Benjamin C. Call. He received a Normal Diploma. Source: Students Record of Class Standings B.Y. Academy, Book 1, Page 72. 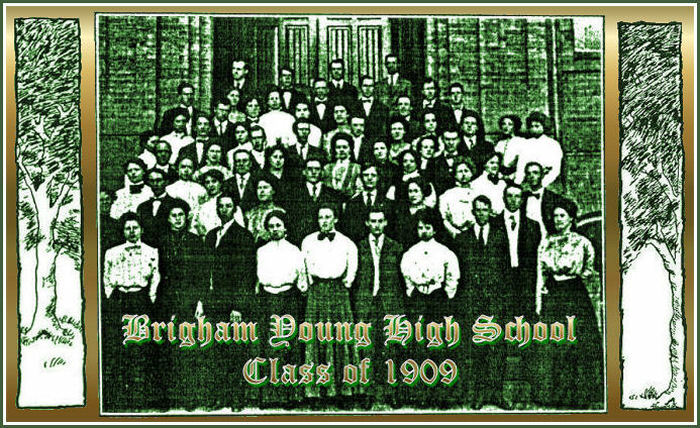 Brigham Young High School, Class of 1909. Florence Chipman. She received a High School Diploma. Source: Annual Record, B.Y. University (BYU Records Office), Book 4, Page 36. Brigham Young High School, Class of 1909. H. Aldous Dixon. He received a High School Diploma. Source: Annual Record, B.Y. University (BYU Records Office), Book 3, Page 197. ~ ~ ~ ~ Collegiate Grad of BYU, Class of 1914. H. Aldous Dixon. He received an A.B. Degree in 1914. Source: Annual Record, B.Y. University, Book 3, page 197. ~ ~ ~ ~ Henry Aldous Dixon was born on June 29, 1890 in Provo, Utah. His parents were John De Grey Dixon and Sarah Ann Lewis Dixon. Aldous Dixon married Lucile Knowlden. Lucile Knowlden was born on December 9, 1891 in Provo, Utah. Her parents were Robert Edwin Knowlden and Mable Twelves Knowlden. Lucile graduated from Brigham Young High School in the Class of 1912. She died on January 22, 1967 in Ogden, Utah. H. Aldous Dixon died on January 22, 1967 in Ogden, Utah. His interment, Ogden, Utah. ~ ~ ~ ~ CONGRESSIONAL BIOGRAPHY: Henry Aldous Dixon (born June 29, 1890 - died January 22, 1967) was a U.S. Representative from Utah. Born in Provo, Utah County, Utah, Dixon attended the public schools until high school, then graduated from private Brigham Young High School in 1909. He then graduated from Brigham Young University, Provo, Utah, in 1914, from the University of Chicago in 1917, and from the University of Southern California in 1937. Instructor at Weber College 1914-1918, president in 1919 and 1920 and 1937-1953. Superintendent of Provo city schools 1920-1924 and 1932-1937. Managing vice president of Farmers & Merchants Bank 1924-1932. He served as member of President's Commission on Higher Education 1946-1948. He served as member of the board of directors, Salt Lake Branch of Federal Reserve Bank of San Francisco 1945-1951. He served as director, Association of Junior Colleges from 1950 to 1954. He served as president of Utah State University at Logan from August 1953 to December 1954. Dixon was elected as a Republican to the Eighty-fourth, Eighty-fifth, and Eighty-fifth Congresses (January 3, 1955 through January 3, 1961). He did not seek renomination in 1960. He served as an instructor at Brigham Young University until 1965. He died in Ogden, Utah, on January 22, 1967. His interment, Washington Heights Memorial Park. ~ ~ ~ ~ Memorial on the campus of Weber State University: HENRY ALDOUS DIXON, President 1919-1920, 1937-1953. Henry Aldous Dixon served twice as president of Weber College, from 1919-1920 and again from 1937-1953. He was a member of the Weber Normal College faculty from 1914-1918. During his first year as president he was influential in planning a financial drive for funds to erect a new gymnasium. During his second term as president, Dr. Dixon was recognized nationally as a top authority in the field of vocational education. He developed the technical education program at Weber. The campus on Harrison was purchased and the first buildings constructed under his leadership. He guided the school in a period of growth immediately following World War II. ~ ~ ~ ~ HIS WIFE, from a tribute published by Utah State University: Lucile Knowlden Dixon. Wife of Henry Aldous Dixon, President of Utah State Agricultural College, from August 1953 to December 1954. Lucile Knowlden was born in Provo on December 9, 1891. Her father was Robert Edwin Knowlden; her mother, Mable Twelves. Lucile grew up in Provo, attended the Maeser School, BYU High School [graduating in the BYH Class of 1912], and received her normal degree from Brigham Young University. Lucille married Henry Aldous Dixon on June 2, 1915 in Salt Lake City. She taught for two years at the Timpanogos School before her marriage. The Dixons had four daughters and two sons. Before becoming president of USU, H. Aldous Dixon had been superintendent of schools in Provo and President of Weber Junior College from 1920-1924 and 1932-1937, then president of Weber State College from 1937 until 1953. He left the presidency of USU after being elected to the U.S. House of Representatives to the Eighty-fourth, Eighty-fifth, and Eighty-sixth Congresses (January 3, 1955 to January 3, 1961). The Dixons lived in Washington, D.C. for six years before returning to Ogden. Lucile was active in the LDS Church. She was president and a member of the board of directors for the Children's Aid Society, a member of the Acacia Club, and Children's Hour Club. She served as president of Weber College Faculty Women and was a charter member of the Nelke Reading Club of Provo. Lucile loved gardening, growing plants indoors and out. She especially enjoyed African violets and while she lived on campus the university horticulture group regularly brought her fresh flowers. In gathering information for her book on the president's house, Alice Chase learned from Mrs. Dixon that her "heart sank at the prospect of moving into" the president's home. The Dixon's had at that time a new house in Ogden. The president's house had purportedly been neglected and the trustees decided to "recondition" the house rather than build a new house. Despite her initial impressions, Lucile told Alice that "living there proved to be a delightful experience." Lucile died on December 13, 1986 in Ogden. She was 95 years old. Brigham Young High School, Class of 1909. A. Lewis Dotson. He received a High School Diploma. Source: Annual Record, B.Y. University (BYU Records Office), Book 3, Page 27. Brigham Young High School, Class of 1909? Cyril Duffin. He appears in a photograph of the BYH Commercial Class taken in 1909 -- 20 students all wearing identical outfits with a big "C" on their jerseys. Brigham Young High School, Class of 1909. Harold Finch. He received a High School Diploma. Source: Annual Record, B.Y. University (BYU Records Office), Book 4, Page 96. Brigham Young High School, Class of 1909. Vivia Finlayson. She received a Normal Diploma. Source: Students Record of Class Standings B.Y. Academy, Book 2, Page 202. Brigham Young High School, Class of 1909. Clarence S. Gardner received a High School Diploma. Source: Students Record of Class Standings B.Y. Academy, Book 2, Page 24. Brigham Young High School, Class of 1909. Nellie Hansen. She received a Domestic Arts, Domestic Science Diploma. Source: Students Record of Class Standings B.Y. Academy, Book 2, Page 241. Brigham Young High School, Class of 1909. Dora Henry. She received a Music Diploma. Source: Students Record of Class Standings B.Y. Academy, Book 2, Page 83. Brigham Young High School, Class of 1909. Reuben L. Hill. He received a High School Diploma. Source: Annual Record, B.Y. University (BYU Records Office), Book 4, Page 137. Brigham Young High School, Class of 1909. Edith Hindlay [actually Hindley] received a Music Diploma. Source: Students Record of Class Standings B.Y. Academy, Book 2, Page 181. ~ ~ ~ ~ Edith Hindley was born on November 1, 1887 in American Fork, Utah. She married ______ Taylor. Edith Hindley Taylor died on November 18, 1961 in Salt Lake City, Utah. Her interment, Salt Lake City Cemetery, Utah. Brigham Young High School, Class of 1909. Hugh Holdaway. He received a High School Diploma. Source: Annual Record, B.Y. University (BYU Records Office), Book 3, Page 65. ~ ~ ~ ~ BYU Class of 1911. Hugh Holdaway. He earned a B.A. Degree in 1911. Source: Students Record of Class Standings, B.Y. Academy, Book 3, p. 64. Brigham Young High School, Class of 1909. Mimmie Iverson. She received a Normal Diploma. Source: Students Record of Class Standings B.Y. Academy, Book 2, Page 245. Brigham Young High School, Class of 1909. Thatcher C. Jones. He received a Commercial Diploma. Source: Students record of Class Standings B.Y. Academy, Book 2, Page 247.